Imagine a square patch of ground in a garden, and because it's a good garden there are worms around, and they feed from the soil. Well, I've taken an imaginary square and given it the numbers 1 to 100. 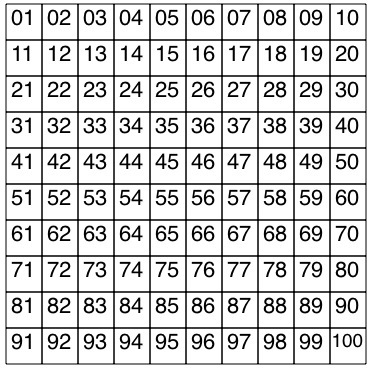 You've probably come across number squares like this in maths sometimes at school. 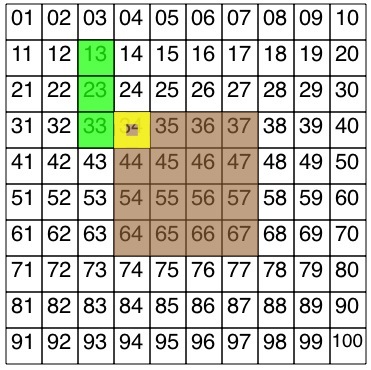 So each part of this square piece of ground has a number. But now, suppose that the centre piece of this square is what the worm likes to eat most of all. So I've taken the centre 16 squares and made them a little darker. 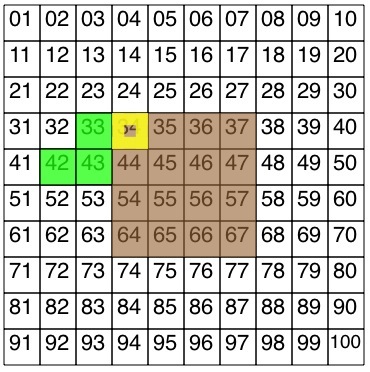 You will probably notice that the lowest number in this square is 34 and the highest is 67. Well, that's enough about the ground. What about the worm? The worm will be 4 squares long and to make sure we know which is the head and which is the tail I've coloured the head part differently. Of course the worm can bend itself in different ways. But I'm going to suggest that on this occasion it has 4 square parts [like 4 multilink] which have to be joined edge to edge in the "normal'' way. Here are three examples that would be O.K., and one which is not because the head is not at the end of the body! Now, to set up the challenge. 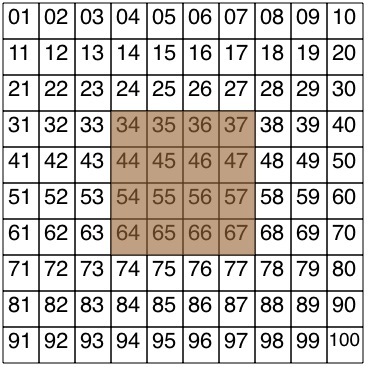 With a square in front of you, with the numbers 1 to 100 marked on as shown and the centre 16 squares marked in some special way, place your worm, perhaps made out of multilink, on the square. [Multilink are 2 cm long so get hold of some 2 cm squared paper; the backing paper for some "taky-back'' film is just the right size.] When you place your worm you have to make sure that the head is on one of the centre squares that are shaded differently. The head stays there, but while the worm is eating it wriggles and changes the shape of its body, in as many different ways as it can. Here are just three of the many ways in which the worm can be, and I've placed its head on the number 34. 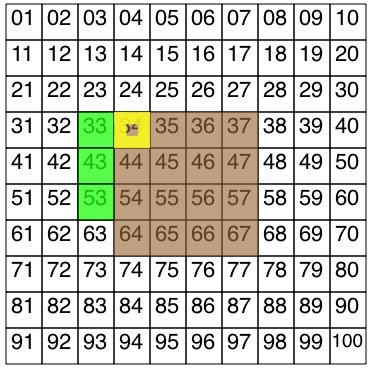 Find all the shapes and positions that the worm can be with its head fixed in the one place [in my example, on number 34, but you can choose any of those 16 squares]. Don't forget about the worm's body going North, South, East and West. so that you can compare the results easily. Well, that's really it! Of course at the end you have to say "I wonder what would happen if I ...?''. Visualising. Investigations. 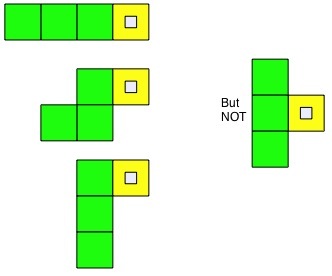 Addition & subtraction. Interactivities. Comparing and Ordering numbers. Multiplication & division. Trial and improvement. 100 square. Combinations. Working systematically.